Redeemer Church is about to embark on a new journey. Just a matter of a few months ago no one in our church would have thought we would be in the process of purchasing a building. It is true that this was not something any of us were seeking out or expecting. And since the occasion has come about by such surprise and since the process of acquiring a building is such a momentous decision it is good and right for us to ask the hard question: why buy a building? After all, we are a relatively new, young (in years and in membership) church without a lot of money and it is our stated mission to plant churches by building redemptive communities of gospel-centered people. So, how does buying an old building with a mortgage and repair costs and other added expenses make sense in our current situation? 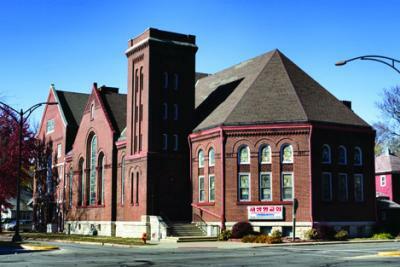 First, it’s important to remember that Redeemer Church has always had a building and has always paid for a building. As long as Redeemer Church continues to meet together for worship, preaching, and ordinances we will need a place to meet and more than likely we will be paying for it. Whether that building is the BASIC house, Hawthorne Suites Hotel Conference Center, or the IMC, God has never failed to provide us with what we need for that season. Whether we are locked into a rental contract or a mortgage we are required to pay a monthly payment and a certain amount of expenses. The question we have to ask ourselves is, “Given our current circumstances, what is the best use of the resources God has entrusted to us?” But instead of focusing on the financial side of things (which is a necessary aspect of the decision), I would like to provide what I think are some particular gospel implications for us as we move toward the purchase of the new building. Having our own building with our own space, gives us an outpost and training ground for the purposes of the gospel. The elders of Redeemer Church have big ideas and big plans. We want our congregation to be more equipped with biblical truth. We would love to see more men preparing for church planting, missions, and gospel ministry. We would love to see more children being trained up in the fear of the Lord. And, by God’s grace, we have been seeing these things happening in the life of Redeemer. But we have grown to a size that makes it increasingly difficult to maintain our current church structure and especially difficult if we continue to grow at the rate we have been growing. Purchasing this building will give us the space we need to continue pursuing gospel ministry and hopefully many, many more years of growth. We see the purchase of this building not as a hindrance to fulfilling our mission, but as a great help. Our children’s ministry space at the IMC is particularly strained right now. The Lord has blessed us with an abundance of little children with many more on the way in the near future and no reason to expect that growth rate to slow down. This presents a clear problem for us because there are no other available rooms at the IMC for us to rent that would be useful for our children’s ministry. On top of our current situation is the future predicament of how to minister to our children as they get older. Our current space is very restrictive when it comes to our children’s ministry and makes future planning very difficult. We look forward to the added space and ministry opportunities of the new building! Purchasing a building will give us a wider hearing within our community. We have learned over the past 6 years that in order to reach people with the gospel in our Central Illinois context it is very helpful to have a more traditional, established meeting space. Many people who are looking for a church home in our area still expect churches to meet in a building that was actually made for a church. When this is not the case many people become uncomfortable and start looking elsewhere. It is not sinful or a mark of worldly capitulation for us to seek to meet our community where it is on this issue. It is no secret that as a gospel-preaching church we want the message of Christ to be extended to as many people as possible and we should be willing to do whatever we can (within the bounds of Scripture and wisdom) to make the gospel accessible. It is our hope and expectation that many more people would come to know Christ and join us in our mission because they feel safe and comfortable within the walls of our meeting space. Restoring a 120-year old, historic building shows that we care about this community and we value what it values. There are many people in the Champaign-Urbana area that value the restoration of historic landmarks and properties. By purchasing this building and doing what we can (albeit slowly) to restore it and use it for it’s original, intended purpose we are joining with our community in saying that we care about the heritage of our town and we are willing to invest time, money, and energy in the preservation of the things that help us remember the past. It is this kind of pursuit that will resonate more with our community than building a brand new structure outside of town ever would. As Christians we should understand the value and beauty of the created order better than anyone else. We understand that we have the privilege of being sub-creators, under the authority of the one, ultimate Creator. This allows us to participate in restorative art in a way that the watching world cannot understand. We see this building as an opportunity to bring attention to the greatness and beauty of God as his creative creations. The gospel can be put on display more clearly through restoration and renovation. I say the gospel can be put on display more clearly because simply buying an old building and restoring it alone is not a display of the gospel. People do that kind of thing all the time without any reference to the gospel. In fact, it’s the hip thing to do. After all, that’s what the developers in line before us were going to do. But what if there is a way to restore this building as a way to make the gospel even more visible to the watching world? Just as God does not tear us down and start over with something new, so we will not. And just as God takes over ownership of our hearts and embarks on the lifelong process of reshaping and reorienting our hearts, so we will seek to picture that throughout the life of this building. And here we are, 119 years later, about to purchase the same building. May God give us wisdom to use his resources for his glory and the good of our city. We plead with God that many men, women, and children would be gathered around his throne at the end of time because they heard the gospel preached and saw the gospel made visible in the life of Redeemer Church.